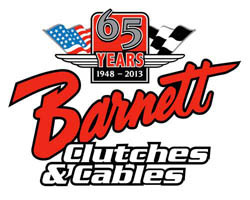 Barnett custom clutch cables and performance motorcycle clutches. When it comes to what moves you it's your clutch that puts the power to the pavement. Barnett custom clutch cables and performance motorcycle clutches are simply the best. 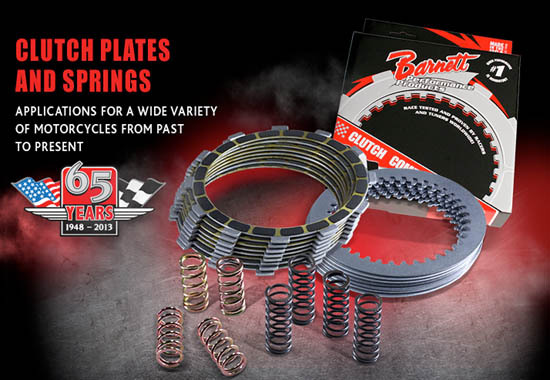 When its time to upgrade your motorcycles clutch weather your cruising, racing touring or just beating your machine around town Barnett will have a clutch pack springs plates cables and more you need to keep it tight. Clutch discs and springs available for most models. Heay duty Kevlar or Carbon Fiber friction plates offered for many model motorcycles. Discs sold individually or in packs. Spring kits are heavy duty or standard. Barnett cables are smooth working and long lasting and are made with the finest components available, making them virtually indestructable. Stainless steel cables with clear coating offer a custom look without fear or damaging other parts of the motorcycle. Available with standard nylon-lined PVC-coated casings in standard diameters and alternate lenths. Our main website provides information about our full service motorcycle shop in Horsham, PA. Hours directions products and services. A tech support forum for questions and answers to issues related to all makes and model motorcycles. You can now buy motorcycle parts and accessories from fantastic suppliers like Drag Specialties, Bikers Choice, Western Power Sports and Custom Chrome. We also have direct availability of OEM Factory parts and accessories for Honda Yamaha, Kawasaki Suzuki and Harley Davidson motorcycles as well as Off road dirt bike parts and equipment and ATV parts and merchandize. BikesBuiltBetter is your one stop source for all your Metric Cruiser Sport Bike ATV and Off road Dirt bike needs.